What are zucchini noodles? 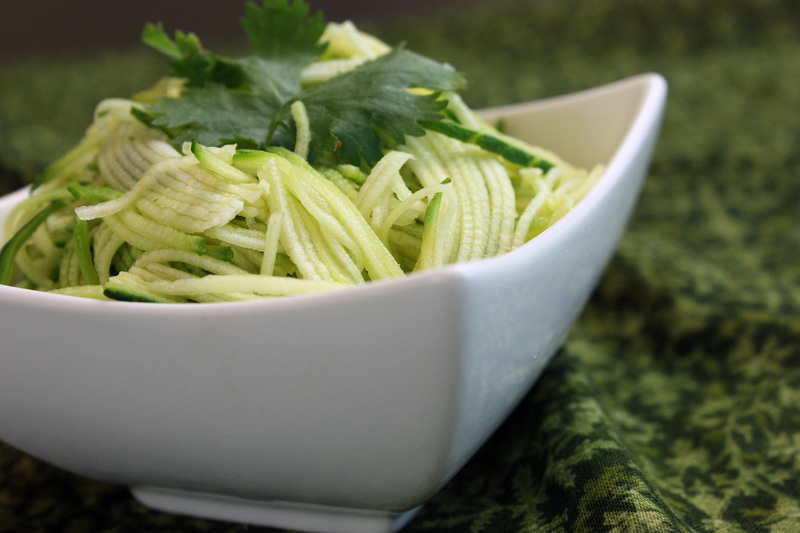 Well, they’re not really noodles, but rather, they are very thin strips of raw zucchini. I have a spiral slicer, and thought I’d put it to use making noodles. I wanted something grain-free to eat with a chicken curry, and this was just the thing. So how about that curry? This is definitely an easy weeknight curry. I didn’t make the curry paste from scratch. (shocker, I know) I used Thai Kitchen red curry paste. This made the whole dish come together much more quickly. 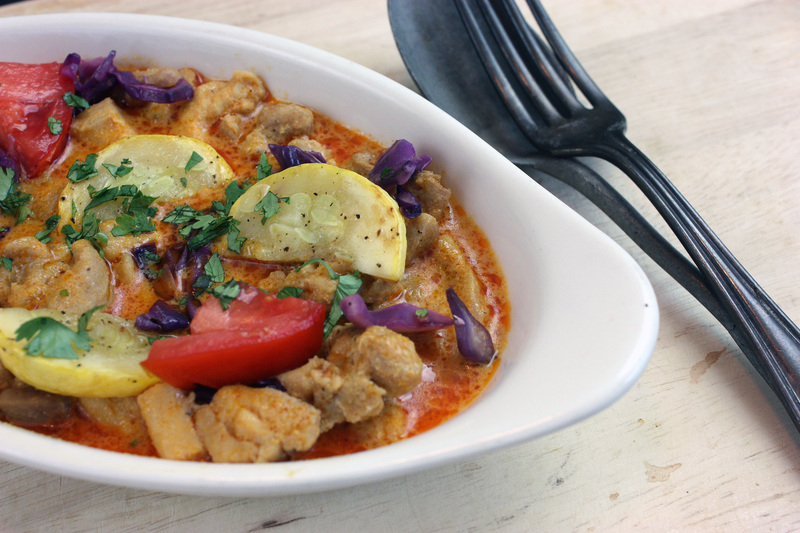 While it’s not a traditional Thai curry (I haven’t seen many Thai curries with red cabbage and yellow squash…I just threw them in there because I had a ton of vegetables in the house that needed to be eaten, and it sounded tasty to me. ), the flavors still worked well together. It was warm, slightly spicy, and comforting – all great attributes in a curry. (Aren’t saucy curries like, the ultimate comfort food? They are to me – and it doesn’t matter if it’s an Indian curry, a Thai curry, a Jamaican curry, or a totally-new-invention curry. They all make my belly happy.) And those zucchini noodles? They kept it from feeling heavy. In the summer, that’s a definite plus. Heat a large skillet to medium-high heat and add 1 tablespoon of the coconut oil. Swirl to heat, and add curry paste. Stir the paste around for a few seconds to get it sizzling. Season the chicken with a bit of salt and pepper, and add to the skillet. Stir until the paste is evenly coating the chicken, and cook, stirring occasionally, until chicken is browned, about 3-4 minutes. Add the coconut milk, lemongrass, and Kaffir lime leaves. Bring to a boil and reduce to a simmer. Allow to simmer, stirring occasionally, for about 10 minutes, or until the sauce has thickened well and flavors have melded. Adjust seasoning to taste. While the curry is simmering, heat another skillet to medium heat. Add the remaining coconut oil and swirl. Add the squash and cabbage and saute, stirring occasionally, for 2-3 minutes or until the squash is lightly browned and the cabbage is starting to wilt. Add the tomatoes and stir for a moment. Season with salt and pepper. Add the vegetables to the curry and stir. Serve on top of zucchini noodles, spaghetti squash, or steamed rice. Garnish with chopped cilantro. A while back, Skyhorse Publishing contacted me about a book to review. The publicist told me that a great majority of the recipes in the book were naturally gluten-free, but were also approachable to any guest at the dinner table. Her recommendation and the title of the book drew me in. The Whole Foods Kosher Kitchen – Glorious Meals Pure and Simple, by Levana Kirschenbaum. The majority of my cooking is 100% whole foods, so this sounded like a perfect addition to my cookbook collection (which currently has outgrown all available bookshelf space, and is now occupying some pantry shelf space, as well as space above my kitchen cabinets, and there are more without a home right now. I may have a problem…). I readily agreed to review the book, and asked for some additional copies to share with you all in a giveaway. Of course, they agreed! This book was just as was described to me. There are countless delicious, mouth-watering, healthy recipes made from real, whole food ingredients in this book. Homemade harissa? Curried apple kale soup? Moroccan turkey patties in lemon sauce? Just hearing those recipes makes me hungry. I currently have about a dozen recipes bookmarked in this book to make. But late one evening, when I was on my own for dinner, I decided to whip up a super-easy recipe for sardine salad. Sardines, you ask? Aren’t those the gross little canned whole fishes? Okay, before you click away, hear me out. To many, sardines are a bit off-putting. I understand that. But they sure pack a nutritional punch. For people like me who can’t consume dairy, there aren’t many calcium-rich foods out there. But sardines are an exception. They pack nearly half of the daily requirement of calcium, thanks to those tiny edible bones. They’re also a great source of protein and omega-3s. For the price (a can of sardines costs about a dollar), they are one of those “must-have” budget foods in your pantry. If you’re skeptical about the taste, this salad is a great way to start. 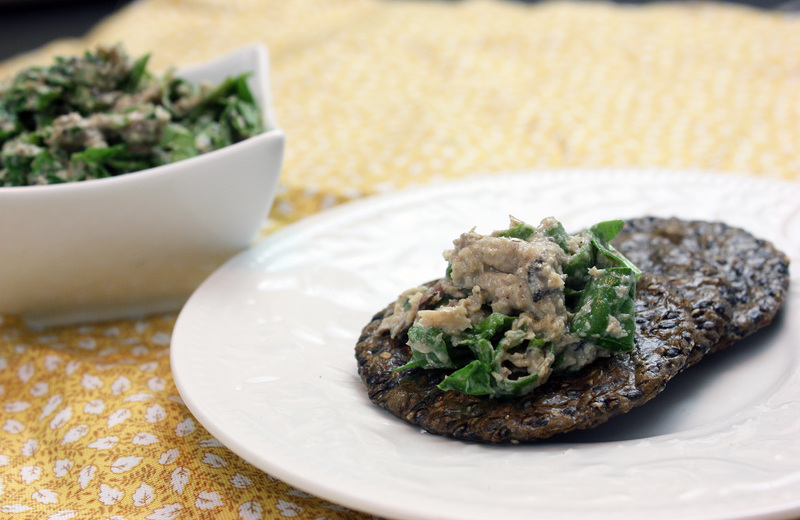 The tahini, lemon, and greens cut the “pungent” flavor of the fish, and when you’re mixing the ingredients together, you won’t see the skin and bones of the sardines. If you try it, you just might find these little fishes to be to your liking. While I’ve long adored sardines (particularly in another salad recipe I found over at City|Life|Eats), this recipe further established my love for them. It definitely was the perfect light meal. And now, the giveaway. 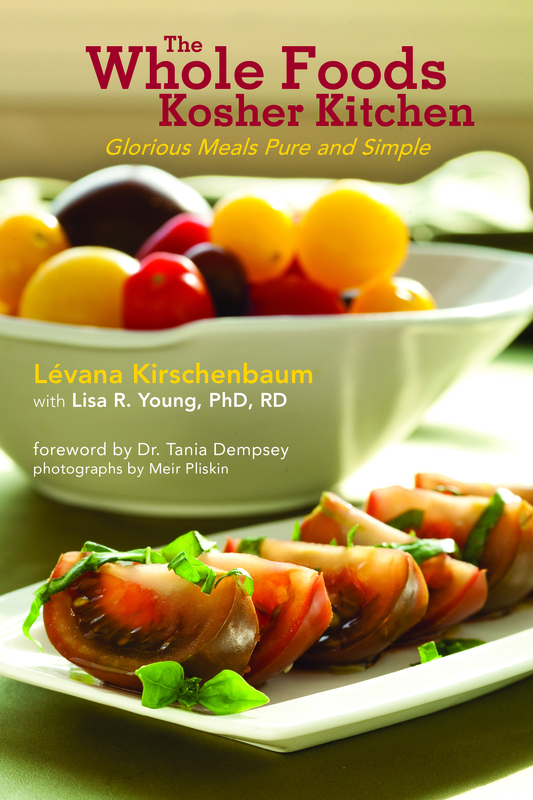 I am giving away two copies of The Whole Foods Kosher Kitchen by Levana Kirschenbaum, courtesy of Skyhorse Publishing. To enter, leave me a comment. To gain additional entries, post about this giveaway on Twitter or Facebook, and come back and leave me a comment telling me you did so. The giveaway will end Sunday, July 31, 2011. Steph from Stephfood was our Daring Cooks’ July hostess. Steph challenged us to make homemade noodles without the help of a motorized pasta machine. She provided us with recipes for Spätzle and Fresh Egg Pasta as well as a few delicious sauces to pair our noodles with. Of course, those recipes were merely inspiration for my dish. I went off to find my own gluten-free pasta recipe. I’ve made gluten-free pasta only once before (an egg-yolk ravioli that was tasty, but my pasta was too thick and heavy), so this was still a relatively new experience for me. I wanted to make sure I made it thin and light this time around. I wanted it to be delicious. Lucky for me, Shauna over at Gluten-Free Girl and the Chef made pasta just a few days before I did. Her pasta was beautiful, and I loved the way she opted to incorporate psyllium husk to increase the flexibility/stretchiness of the dough. I’ve been using psyllium husk a lot more lately in my baking, and am enjoying the results. I was sold. I wanted the flavor and texture of the pasta to shine through, so I wanted a sauce that wouldn’t overwhelm or cause the dish to be too heavy. After all, we’ve had temperatures at 100 degrees or more for nearly two weeks now, so a lighter dish was definitely a plus. 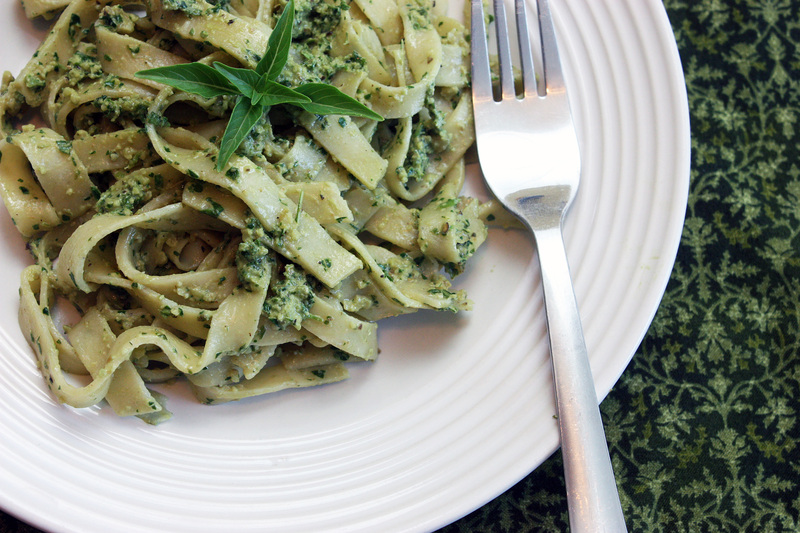 My garden is overflowing with basil, so I opted for a fresh, bright, dairy-free pesto. Basil is one of those herbs that just screams summer to me. It was the perfect compliment to my pasta. The pasta was somewhat finicky to make – rolling it thin wasn’t much of an issue, however, I had a bit of trouble with it breaking while rolling. After a bit of practice and patience, though, I fell into a rhythm. It started to work. I now understand why so many people love making pasta. It’s as soothing as making bread – a slow, repetitive, and strangely comforting process. I started to fall in love myself. Once the pasta was all rolled and cut, the rest of the process was easy. Glazing the walnuts in the maple syrup, and then a quick blitz in the food processor, and the pesto was finished. The pasta took only 2 minutes to cook. A quick toss, and we were more than ready to eat. Combine the flours, psyllium powder, nutmeg, and salt in the bowl of the food processor to combine the flours. Mix the egg, egg yolks, 1 tablespoon of the olive oil and 1 tablespoon of the water. Pour the liquid into the flours. Run the food processor on pulse 8 to 10 times, then look at the dough. If the dough has formed crumbs that stay together when pressed, you’re done. If they are a little too dry, add the remaining olive oil, then pulse, look, then add more water, if necessary. If the dough looks a bit too wet, add another tablespoon of flour. Turn out onto a dry, clean surface. Gather into a ball with your hands and press together. Once a ball is formed, cover with plastic wrap and allow to sit for 30 minutes. Cut ball of dough into 4 pieces. Lightly flour your working surface with any of the flours you used for the pasta. Roll out one of the pieces of dough in a rectangle until very thin, as thin as you can get it without breaking. Cut with a pizza cutter into strips, carefully placing each strip onto a plate. Cover the cut pasta with a damp cloth as you go. To cook the pasta, bring a large, well-salted pot of water to a boil. Carefully lower your pasta into the water and cook for 2 minutes, or until the pasta is cooked through but still retains some bite. Drain and toss with a bit of olive oil, then your sauce/pesto. In a small skillet at medium heat, add the walnuts, maple syrup, and olive oil. Cook, stiring slowly for 2-3 minutes or until syrup clings to the walnuts and starts to caramelize. Remove and place in the bowl of a food processor. Add basil, parsley, nutritional yeast, orange juice, garlic, salt, pepper, and brown rice vinegar and pulse, scraping the bowl as you go, until everything is finely chopped, but not a uniform paste. Taste and adjust seasonings as needed. Adopt A Gluten-Free Blogger is being hosted this month by Wendy of Celiacs In The House. I love Adopt A Gluten-Free Blogger – while I love reading and trying to keep up with all of my favorite gluten-free blogs, reading, gawking, and sometimes drooling, I almost never seem to find time to actually make the recipes I salivate over. This event gives me an opportunity to slow down and actually try a recipe. Thing is, I rarely find it easy to decide which recipe to make. This is definitely the case when it comes to my adoptee this month – Ricki of Diet, Dessert, and Dogs. Ricki is definitely a powerhouse in the kitchen. Her blog has hundreds of delicious, Anti-Candida Diet (ACD) friendly recipes, and she has published 4 books. I own them all. I love her latest – Good Morning! Breakfasts without Gluten, Sugar, Eggs, or Dairy. Her innovative ways of creating sweet, delicious, healthy recipes using healthy ingredients really gets me to think outside the box. I imagine that going through the healing process of the Anti-Candida Diet forces one to do just that, especially when cravings for waffles, cakes, or fudge strike. Ricki amazes with her ability to satisfy those cravings. 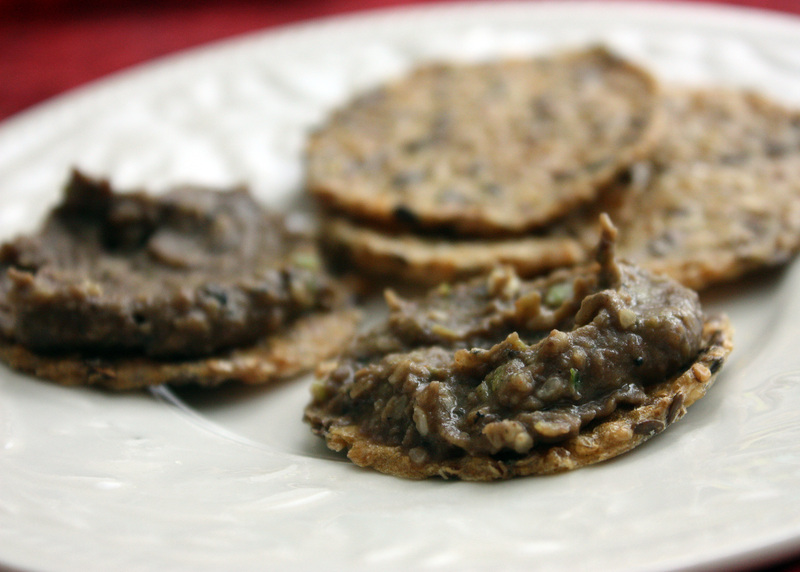 Lately I’ve been in need of good, healthy snacks to pack for lunch, so I made Ricki’s adzuki bean spread. Wow, is it delicious! I am a sucker for bean spreads/dips in any case, but this was unique. It had a lovely umami punch from the miso, and a bit of a bite from the green onions. The creaminess of the beans (I love adzuki beans – they’re one of my favorites, and have appeared here before.) brought everything together. A bit of this stuff, spread on some Mary’s Gone Crackers and enjoyed along a quickly packed lunch of carrot sticks and celery was the perfect easy-to-make lunch. I’m definitely making this again – perhaps even as a quick dip for a party. Next on my list of recipes to make from Ricki? Her “swiss cheese“. This really has me intrigued. Homemade vegan cheese cubes? I am seeing a salad very soon in my future, topped with these little treats! Where have the menu plans gone? You might be asking. They haven’t been posted on my blog for a few weeks now. Well, long story short, I was on vacation for 2 weeks. While I had vague ideas of what I planned on cooking, I was in the midst of testing so many recipes for my upcoming book, and our schedule was so lax, that I didn’t have an actual “plan.” (In fact, there were evenings where, after hours of cooking and testing recipes, my husband asked what was for dinner, and my only plan was something like “There are brownies, a cake, crackers, bread, some tomato jam, and I’m working on a meatloaf. Would you like any of that?” I had tons of food around, but often, there wasn’t a cohesive meal in sight.) Last week, I was still in post-vacation recovery mode, and a lot of the meals were last-minute compilations of what we needed to use up. Finally, this week, we’re back into the swing of things. One of the recipes I was testing during my time off was a recipe I debuted last year, albeit in a slightly different form, as an appetizer for a crowd of guests (gluten and dairy eaters) that were visiting. 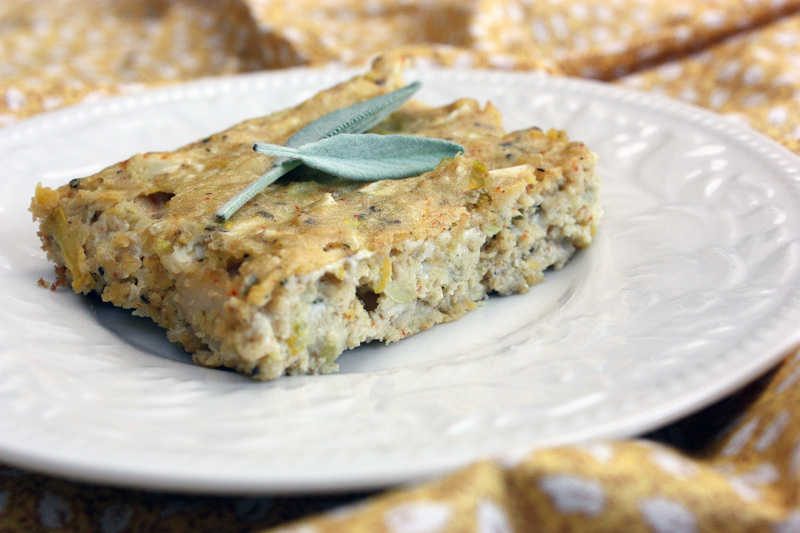 Originally it was called an “appetizer square”, and was made with zucchini and crumbled pork sausage, rather than summer squash and chicken. It obviously went over well, as the pieces were gobbled down fairly quickly. When I came across it again, I remembered the abundance of squash in the refrigerator, and decided to make a different version. It turned out to be even better than the first, in my opinion. What’s lovely about a recipe like this is that it’s versatile. Zucchini or summer squash can be used – and this time of year, most of us have more of both of these veggies than we’d like, so it’s a great way to use it up! Any leftover cooked meat can be used – or even beana (I could imagine black beans tasting scrumptious here!). Spice it how you’d like. Serve it for breakfast, lunch, dinner, or as an appetizer. The sky is the limit here. Heat a skillet to medium heat and add 1 tablespoon of olive oil. Add onions to skillet and sauté for 3-4 minutes. Add garlic, sage, and chicken and sauté for another minute. Remove and allow to cool while you prepare the rest of the dish. Grease a 13X9 baking dish and set aside. In a large bowl, whisk eggs until blended, and add the rest of the oil and whisk. Add in the flours, baking powder, onion-garlic-chicken mix, grated squash and remaining ingredients. Spread into prepared baking dish and bake for 20-25 minutes, or until browned on top and a toothpick inserted in the center comes out clean. Cool for 5 minutes and cut into squares. Makes 16 appetizer servings. And now, for the menu for this week! Snacks this week will include fresh peaches, black bean dip on brown rice cakes, and apples with peanut or almond butter. I also have Tanka bars on hand if I need a bit of protein. Want more great menu ideas? Check out Celiacs In The House and the Gluten-Free Menu Swap! This post is linked to Slightly Indulgent Tuesdays at Simply Sugar and Gluten-Free. Jami Sorrento was our June Daring Cooks hostess and she chose to challenge us to celebrate the humble spud by making a delicious and healthy potato salad. The Daring Cooks Potato Salad Challenge was sponsored by the nice people at the United States Potato Board, who awarded prizes to the top 3 most creative and healthy potato salads. A medium-size (5.3 ounce) potato has 110 calories, no fat, no cholesterol, no sodium and includes nearly half your daily value of vitamin C and has more potassium than a banana! Of course, I’ve made potato salad before. My mom has a straightforward recipe that I love (and have blogged about before – scroll down towards the bottom to view the recipe). But for this challenge, I wanted to make a bit of a different potato salad. Immediately, capers came to mind. Their briny, piquant flavor would compliment the creamy potatoes well. Of course, I’d still want to add some creamy texture, so a nice high-end mayonnaise would be needed. In the interest of keeping the salad lower in calories, though, I tried to keep the amount modest. 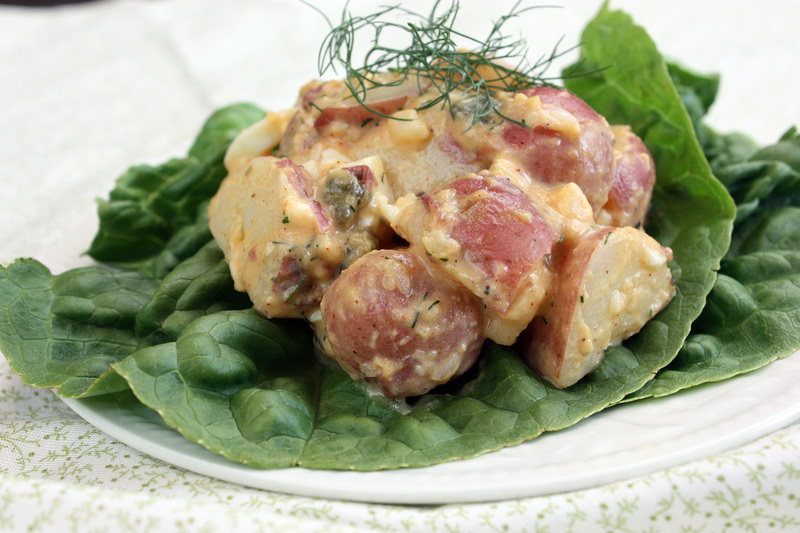 Some fresh dill, dijon mustard, and smoked paprika helped round out what became a full-flavored, potato salad – a perfect accompaniment to any backyard barbecue. Place the potatoes in a medium saucepan with a generous amount of salt and enough water to cover. Boil for 15 minutes or until pierced easily with a fork. Drain and allow to cool. Cut into bite-sized pieces (about 1/2 inch) and set aside. In a small bowl, combine the lemon juice and red onion. Stir to coat, and set aside. In a large bowl, whisk together the mayonnaise, mustard, and honey. Add capers, dill, smoked paprika, salt and pepper and whisk to combine. Add in the potatoes and eggs and toss with the dressing until evenly coated. Taste and adjust salt and pepper as needed. Serve chilled. Makes 4 servings. I love eggs. They’re not only healthy, a great source of inexpensive protein (even happy, free-range eggs don’t cost much), and one of the speediest things to cook, they also are SO tasty. One of my favorite ways to enjoy an egg is simply cooked sunny-side up, followed closely by poached. But sometimes, I want something with a little more flair, and more ability to incorporate the plethora of veggies in my kitchen. This is when an omelet is just the thing. Omelets don’t need to be complicated. Of course, mine aren’t as delicately fancy and thin as some, but for my everyday breakfast, that’s fine by me. Just a single fold – enough to allow the filling inside to get all warm, melty, and mingled with the egg – works for my quick and healthy breakfast. I’ll save the fancier stuff for fancier occasions. 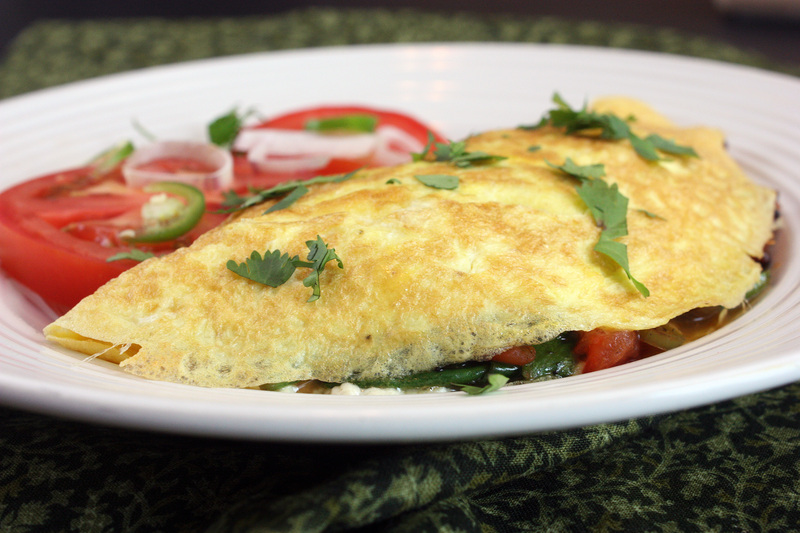 Another bonus about omelets – each one is customizable. That way, if you’re making omelets for other family members, everyone can pick out their favorite fillings. Today, I opted for a Southwestern style – a sauteed mix of shallots, diced tomato, serrano pepper, and spinach, topped with just a tiny bit of Daiya cheese. It was spicy, fresh, and packed with powerful flavors, but light enough so that I had energy to get on with my day. My kind of breakfast. Heat a small skillet (mine was about 8 inches) to medium heat and add half of the oil. Saute the shallots and serrano chile for 2-3 minutes or until softened. Add tomato and spinach and continue to saute until spinach is wilted. Remove and set aside in a small bowl. Wipe out the skillet and add the rest of the oil. Swirl to coat well. Lower the heat to medium-low and add the eggs. Allow eggs to sit without stirring for a minute. Once eggs start to cook on the bottom, take a flexible spatula and carefully pull the edges of the eggs away from the skillet and allow the runny part to fill the space underneath. Do this all the way around the omelet. Repeat this once or twice more, or until the egg is starting to set up more. Once nearly set, add your veggie mixture on one side of the omelet and top with Daiya cheese. Top with a bit of cilantro. Then carefully flip the empty side of the omelet over onto the filling, holding the top in place for a moment or two, if necessary, until the egg stays folded. Allow to cook for another 30 seconds or so, and carefully remove from pan and put onto plate. I am working on my first e-book! This book will be filled with gluten and dairy-free recipes that are tasty and healthy for the whole family, made from whole foods and real ingredients. But I need your help to make this happen. I will be furiously working on recipes here at home, but I need testers! If you’re interested in testing out recipes, please send me an email at alta2924 (at) hotmail (dot) com. I hope to be able to have recipe testing start in the next month or so. Thank you in advance for all of your help! This is a huge step for me, and I have so many dreams for this book – I certainly hope it’s as exciting for you as it will be for me!